In honor of the upcoming New Year, Chamah arranged a festive evening to celebrate the upcoming Rosh HaShana at its campus in Kiryat Malachi. Hundreds of immigrants from the Russian Federation enjoyed the program which included a festive meal, greetings from the local Mayor and toasts to the New Year! Chamah extends warm wishes to all of its kind supporters and friends a very healthy, happy and prosperous New Year! 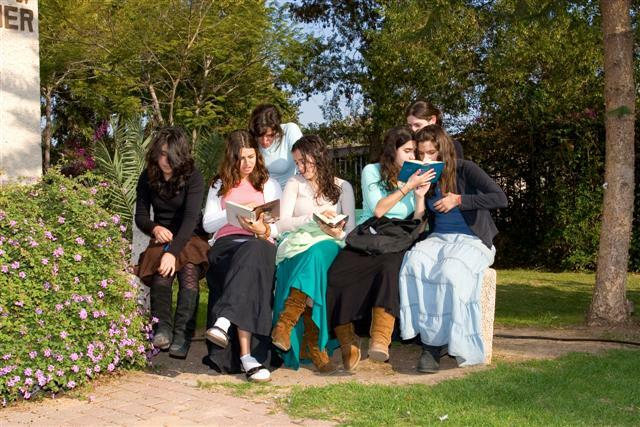 Since the units at the Chamah Campus in Kiryat Malachi have been recently renovated, the series of weekend retreats have expanded. Hundreds of immigrants from throughout the country have been hosted at the premises enjoying a relaxing and intellectually challenging occasion. As every year, the 9th of May is a joyous day at Chamah and for all WWII Veterans around the world. This day commemorates the victory over the cruel Nazi regime. Proudly adorning their awards, the Veterans gathered for a festive occasion arranged by Chamah. Songs composed in honor of the evening were sung by a special children's chior. The Veterans remembered their fallen comrades and shared stories of courage, faith and inspiration. The Gan Chamah Chess Team participated in a chess match amongst other junior chess players in Moscow. 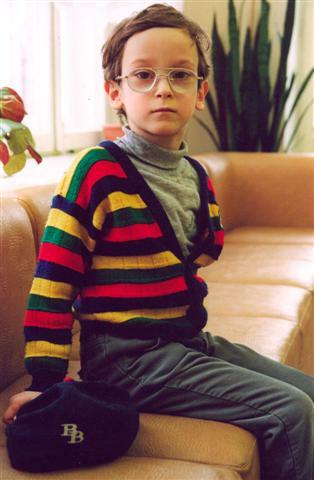 A proud Mordiga Yevgeny from Gan Chamah won the prize for his outstanding performance! Anna Leibergot won first place by playing her musical instrument at the Jewish Art Festival of the Jewish Culture Centers in Russia entitled "Kol Rina". As the first place winner, she will be participating at the International Art Festival to be held in Washington D.C. this August. Anna, we at Chamah are real proud of you! The Weekend Retreat Program has intensified as the sleeping units at the Chamah Center have been renovated comfortably accommodating close to 100 people.The upgrades include new bathroom tiling and accessories, air-conditioning, kitchenette, furniture and linens. 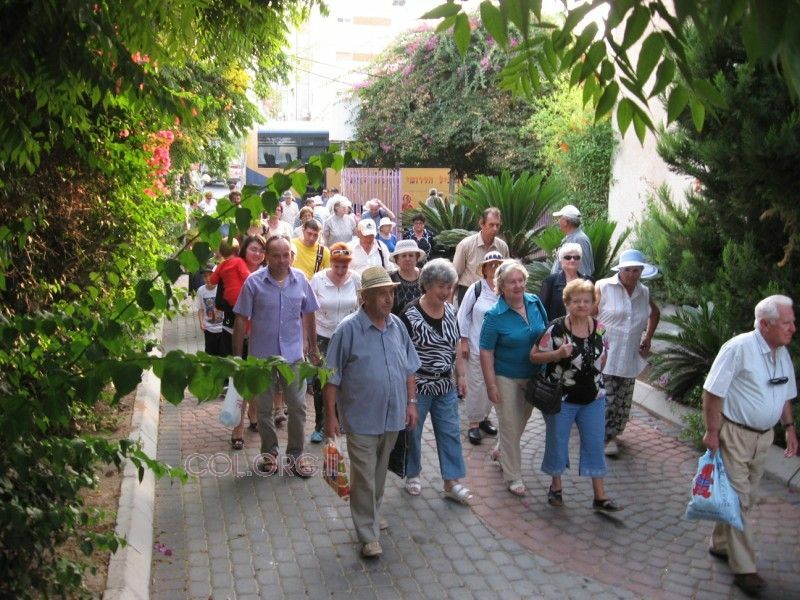 The recent group from the southern towns in Israel such as Be'er Sheba, Sderot, Ofakim and other neighborhoods in close proximity to the Gaza strip thoroughly enjoyed the Weekend Retreat held at the Chamah Campus in Kiryat Malachi. The crowd was comprised of new and veteran immigrants in which the latter will “adopt” the new immigrants easing their absorption. 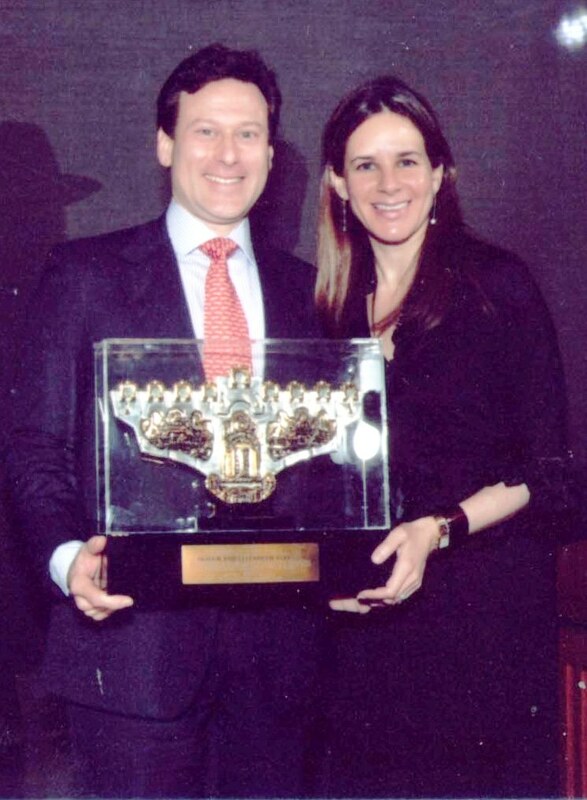 Chamah was honored to host Rabbi Yechiel Eckstein, President of the IFCJ, and his dear wife, Joelle Medina Eckstein. 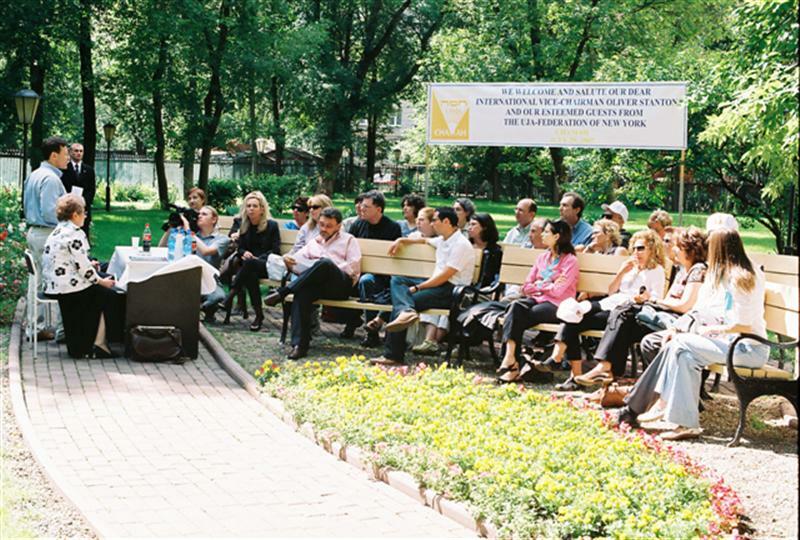 Rabbi and Mrs. Eckstein toured the institutions of Chamah in Moscow and participated in the distribution of humanitarian aid to the elderly and ill. They enjoyed a hot meal at the Chamah Soup Kitchen and were greatly impressed with the life saving activities of Chamah. 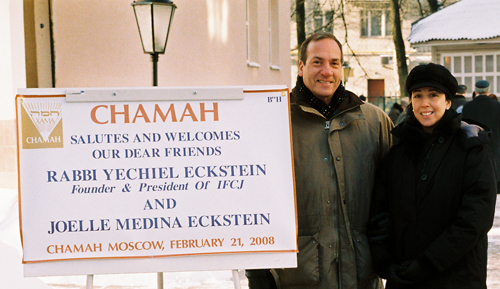 The Ecksteins also visited Gan Chamah and other Chamah facilities. Chamah arranged and hosted a festive convention for holidays. 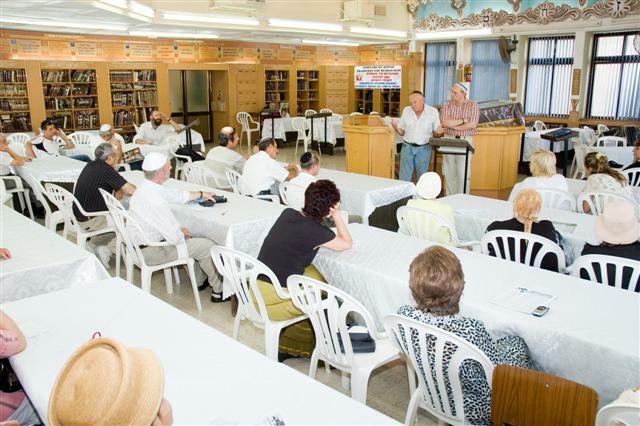 The seminar was attended by hundreds of immigrants from the FSU living in Kiryat Malachi, Sderot, Ofakim and towns throughout the southern region. 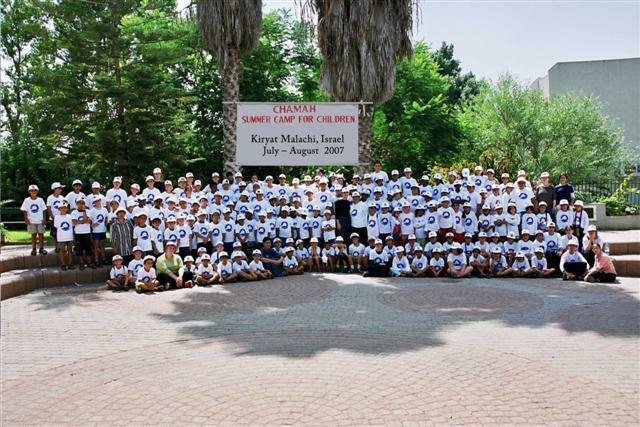 Hundreds of youngsters enjoyed the day camps that Chamah arranged in Israel, Moscow and New York. Along with the trips and exciting activities the campers benefited from a nutritious breakfast and were also given the opportunity to experience Jewish traditions. They are eagerly awaiting next year’s day camps! Southern Israel Citizens- Chamah Cares About You! The steady bombardment of Kassam rockets on Sderot is causing heavy damage to the city. Sderot, Ofakim and neighboring towns in southern Israel are not only plagued by terror, but with high employment rate causing many families to live under the poverty line. 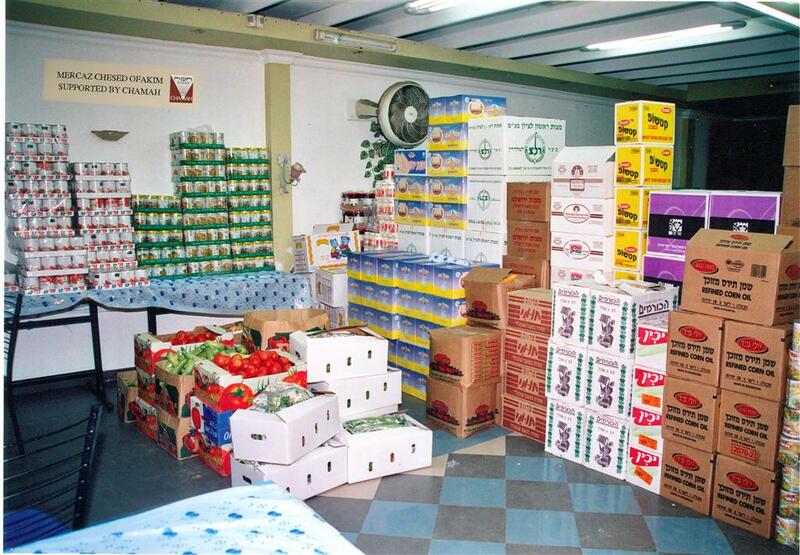 Chamah is distributing food and care packages to the towns citizens who cannot afford the luxury of uprooting to other cities. 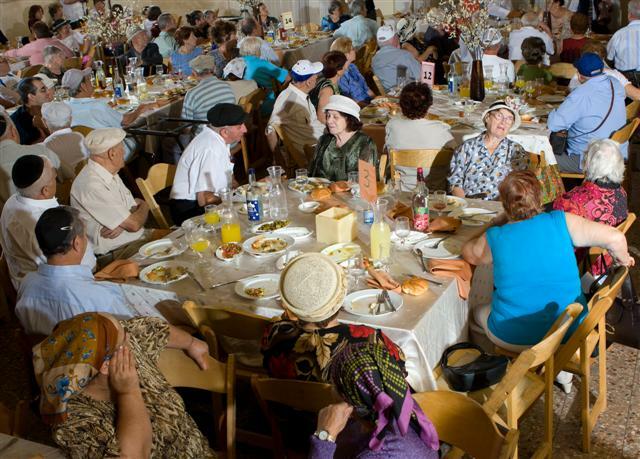 Shabbat Nachamu, July 27-28, 2007, Chamah hosted over 50 families from the Russian Federation at its campus in Kiryat Malachi. The participants enjoyed festive Sabbath meals, lectures and symposiums. Exciting activities were arranged for the children. The quality time spent together in a warm atmosphere cultivated an openness for new experiences and opportunities. This past Shabbat, 26th of May, Chamah hosted a group of students learning at "Machon Medrasha" from Jerusalem. 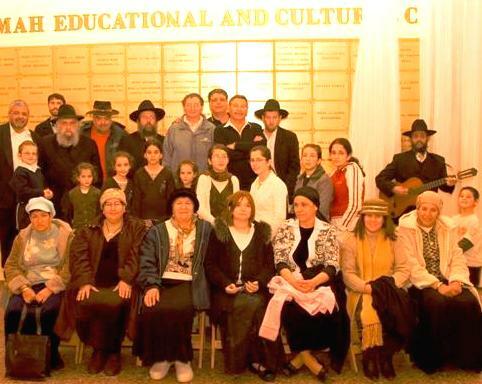 "Medrasha" is geared for post high school youth from the Diaspora to study and tour in Israel for the scholastic year. The students were greatly impressed by the quality of the Chamah campus; the dormitory, dining room, lecture hall etc.